This Overview Vitamins gives information about vitamins which are are an essential part of our diet. Although they are found in small quantities in various foods, they are essential for our metabolism and for life. As they cannot be produced naturally by our bodies, our main source is through food and in some cases medication (i.e. vitamin pills). There are thirteen vitamins; and they can be classified into two categories: fat soluble and water soluble - which is how they are ordered in this Overview Vitamins. This Overview Vitamins is divided into two sections. Fat soluble vitamins dissolve in fat and are absorbed into the bloodstream through the small intestine. These are then carried to the liver where they are stored. Patients with disorders leading to the mal absorption of fats (e.g. celiac disease) will likely have a deficiency of fat soluble vitamins. Water soluble vitamins, unlike fat soluble ones, are not absorbed. Instead, they are temporarily kept and are then excreted through urine. The only exception to this rule is vitamin B12 which is kept in the liver. It is important that we replace these once they are lost. This can be accomplished by eating foods that contain these vitamins on a daily basis. Food sources: yeast, grains, milk, egg yolk, wheat germ, nuts, red meat, cereals, and legumes. Deficiency: when severe it can result in Beriberi which results in muscle weakness, neuritis and paralysis. Other symptoms of deficiency include fatigue, irritability, loss of appetite, mental depression, constipation and gastrointestinal problems. 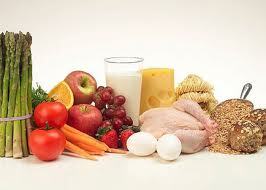 Food sources: green vegetables, liver, wheat germ, milk, eggs, cereals and yeast. Functions: involved in the citric acid cycle and the production of some enzymes. It is also a component of flavin adenine dinucleotide and can act as an antioxidant. Deficiency: eye disorders, cracking of the skin (especially chapped lips) and painful cuts around the mouth. Overdose nausea, vomiting, anemia, low blood pressure and fatigue. Food sources: fish, liver, red meat, yeast, grains, peas, beans, nuts and whole grains. Functions: involved in glycolysis and the citric acid cycle. 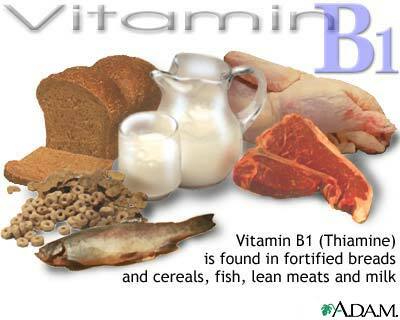 Vitamin B3 is also used for releasing energy from carbohydrates, proteins and fats. It also promotes healthy skin, digestive system and a good nervous system. Deficiency: this can result in Pellagra, which involved diarrhea, dermatitis and disorders of the nervous system. Other symptoms include, fatigue, loss of appetite, nausea, vomiting and a swollen, red tongue. Overdose: these symptoms can include high blood sugar, nausea, vomiting, headaches, jaundice, insomnia, skin rashes, joint pains, calcium loss and others. Dietary sources of B6 are similar to B12 and also include avocado, herring, salmon, sunflower seeds and walnuts. Functions: involved in the synthesis and breakdown of amino acids, aids lipid metabolism, helps maintain a healthy nervous system and plays a role in the release of glycogen from its storage in the liver. Deficiency: can result in dermatitis, retarded growth, nausea, numbness in the hands and feet, depression, insomnia, irritability, kidney stones, anemia, headaches and others. Overdose: can cause severe fatigue, depression, numbness in the hands and feet, migraines, heart palpitations, low blood sugar, hyperthyroid, damage to the spine and nerves, cramps and muscle spasms, arthritis and others. Food sources: liver, leafy green vegetables, intestinal bacteria, whole grains, fruits and beans. Functions: involved in synthesis of nucleic acids (the main components of DNA and RNA), hematopoiesis, the prevention of birth defects and for cell replication and growth. Deficiency: can lead to macrocytic anemia (red blood cells are inflated), neural tube defects, high blood pressure, vascular degeneration, mental disorders, insomnia, cervical dysplasia, depression and others. This type of deficiency is common in alcoholics, people living at poverty level, those with malabsorption disorders or liver disease (e.g., cirrhosis), and women taking the birth control pill. Recently, elderly people with hearing loss have been reported to be much more likely to be folic acid deficient than healthy elderly people. A variety of prescription drugs including antacids, some anticancer drugs, and anticonvulsants interfere with folic acid. Folic acid is needed by the body in order to use vitamin B12. People taking proteolytic enzymes are advised to supplement with folic acid as these enzymes inhibit folic acid absorption. Overdose can cause nausea, kidney damage, abdominal bloating or distention, increased cholesterol, loss of appetite and increased zinc and potassium requirements. Food sources: liver, red meat, milk, eggs and fish. Functions: production of red blood cells, involved in some amino acid and nucleic acid metabolism along with the metabolism of all cells. It also helps maintain the nervous system, involved in DNA synthesis and prevents anemia along with folic acid (see Vitamin B9). Deficiency: can lead to pernicious anemia, disorders of the nervous system, headaches, nausea, shortness of breath, weight loss, severe fatigue, dementia, birth defects and a decrease in the formation of white blood cells and platelets. Overdose can result in anemia (due to folic acid), anxiety, heart palpitations, hyperthyroid, tingling/numbness in the right side of the face or in the right arm, insomnia, liver and kidney diseases and some types of leukemia. Citrus Fruit is an excellent source of Vitamin C, efficient for warding off colds and flu, as it does wonders for the immune systeme. 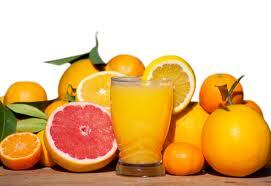 Food sources: citrus fruits (e.g. oranges and lemons), tomatoes, green vegetables. Functions: this antioxidant is need for the synthesis of collagen and helps maintain healthy blood vessels, teeth, gums, bones and ligaments. It is also commonly known for building up immune systems so that we can respond appropriately to infection. It will also improve iron absorption. Deficiency: leads to scurvy, which results in defective formation of the bones and poor healing of wounds. Furthermore, this type of deficiency will increase the risk of infection (due to weak immune system), extreme fatigue and deterioration of the gums. Overdose can affect the body’s metabolism resulting in stomachaches and diarrhea. Food sources: liver, yeast, green vegetables, grains and intestinal bacteria. Functions: involved in glucose production from lipids and amino acids, synthesis of the steroid hormone and part of a co-enzyme (A).